This is for this weeks Sketch challenge. We were to make a tent topper card. This card is a birthday card for a 4 year old boy. I asked Brandon, and he said it would be good for Jake. Although he it would be better for an 8 year old boy. (His birthday is next Tuesday, July 31 -- I guess that was a hint). I water colored the map and the little pirate. I used a post-it note punched out with the small oval punch to do the oval again. I really need to purchase the Amuse oval stamps. (anything to buy more stamps *wink wink*). Great card, love the pirate, smart kid. I really like what you did with this set! I like those tent topper cards, they are fun! Love your tent topper card, Corie! The watercoloring is GREAT! Nice job! How cute is this card? Love it! OMG.. this cards is sooo cute!!! You're so creative!!!! Hugs!!! Perfect for a little guy!! Wow, this is a great card!! 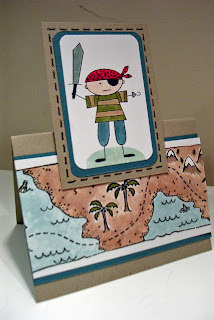 Love the little pirate and the background on the actual card is fantastic!! I love it!! What a fun card! You did a great job on your watercoloring! I have been wanting to try one of these tent topper cards. I love what you did with yours. Love these tent topper cards! This one is SO cute! Fabulous Corie! And I couldn't help but chuckle at Brandon's response! I love this card!! I will have to try a pirate one too!! This is my favorite card that I've seen using that stamp set. FABULOUS! Oh this is so adorable. I have no idea how to make a card like this and I've been seeing them everywhere! Too stinkin cute!!! That is too cute! What a great tent topper card! girl - you are just on it!!! Super cute! I love that you made him a tent topper with the map, what a great idea! Yet another set I'd love to own! This is so cute...great job!! this would make a fabulous invite!!! great job! Very cute. I've been debating about getting this stamp set.